I finally got my new package from Oasap containing my grey cardigan and gold collar necklace. I know gold collar necklace trend has been going on for a while now but I never seems to find the right one all of this time, until I spotted this beauty at Oasap. I'm gonna divide the post into 2 posts, each will be featuring one item so that you can see all the details and the post would not be too long. So today I'm gonna post about the gold collar necklace first. It is a pretty gold collar necklace with matching gold chain that you can adjust the lengths. I love the intricate detail on the "collar". And the gold color is not overly-shiny so I can definitely wear this on daily basis. I went out with my cousins the other day, just meeting up over coffee and gossiping around.. And I thought I'm gonna wear my new necklace ;) I'm pairing it with casual items such as simple tee and jeans, added a lace cardigan, a simple bag and bangle, and off I go to meet my cousins! 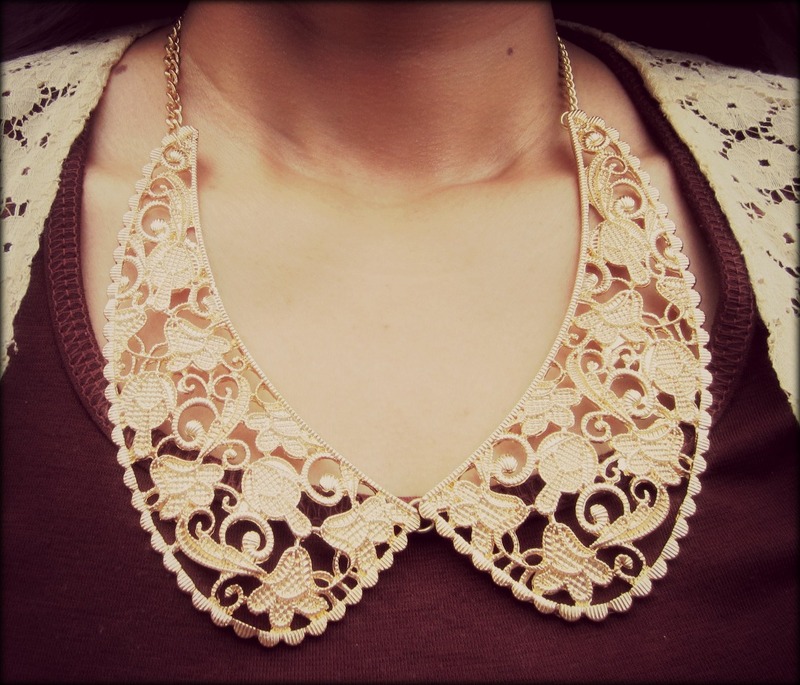 That's what I like about this collar necklace. You can dress it up but you can also dress it down. That means you can wear it with your party dress for a night out or just wear it with simple outfit for daily wear. Because it's already a statement piece of it's own so I reduce the amount of other accessories I'm wearing. I also tend to pair it with simple / solid items to stay away from over-accessorizing. 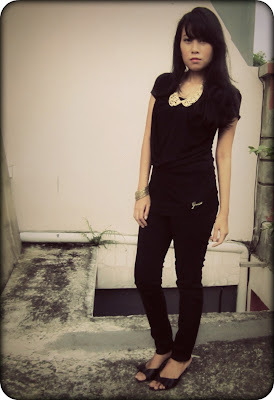 I also did another outfit wearing this collar necklace. I was going out with my husband the other day and I thought I'm gonna glam it up a bit by wearing "black & gold" ensemble. This black top that I'm wearing has a gold signature at the bottom front, so I thought it's gonna accentuate the gold in the necklace. The jeans I'm wearing also has goldware buttons at the front (but you can't really see it in the photo because my top covered it up ;p). So which outfit do you like better? I wanted to say thank you to all my lovely blog followers as well as my twitter followers which surprisingly keep on growing day by day :) Hello my new followers! Thank you so much for your interest in my blog.